Music impacts our auditory environment, affective states (mood, pleasure, emotions), behavior (movement, social behavior), cognition (distraction, focus and concentration) and physiology (heart beat, blood pressure, cortisol, oxytocin, dopamine, opioids), and these effects of music can be utilized to improve patient care. When evaluating the utility/ applicability of music interventions, it is relevant to consider the following: 1) whether the music intervention is active (dancing, playing, singing or music therapy) or passive (listening/watching a performance), 2) whether it is a live performance or a recorded piece, 3) whether the music is self-chosen or chosen by healthcare professionals, music therapists, or others. In the studies reviewed below, we have primarily focused on passive listening to a recorded musical piece, either self-chosen or chosen by others; here labeled music intervention (note that studies investigating the effect of traditional music therapy, involving intervention by a specialized music therapist, are not widely included in this review). 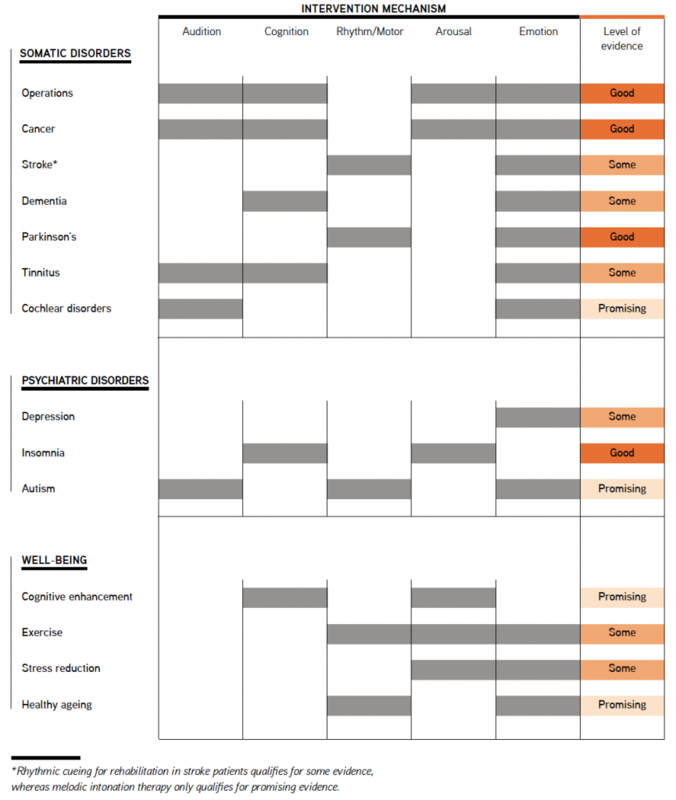 Looking at music interventions for somatic and psychiatric disorders, as well as general well-being, there are an excessive amount of studies available. It is thus a considerable challenge to summarize them succinctly, owing to the wide range of research questions and methodologies that have been employed. Therefore we have aimed to include the fields of research which have been most extensively studied, and where the quality of the studies meets scientific standards. 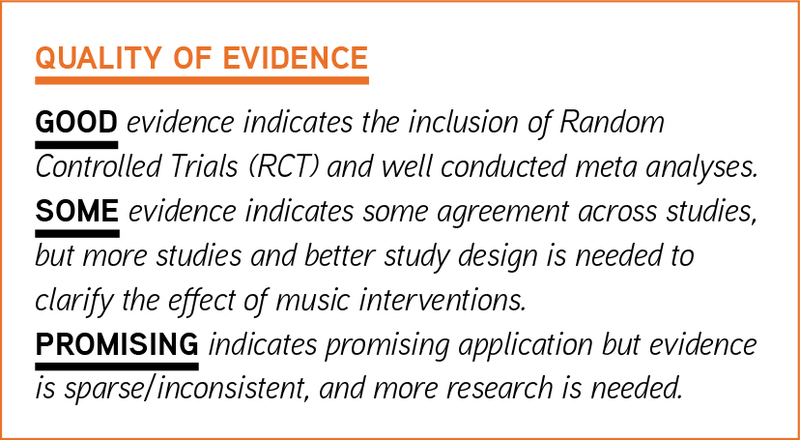 We here aim to draw general conclusions based upon a critical appraisal of multiple experimental studies that nonetheless apply different experimental designs, musical stimuli and measures, and address a multitude of different questions.